Do your banners need somewhere smart to display them in? Are your current banner stands too heavy to carry? Do you need new graphics printed to liven up your trade show display? Superchrome are the leading exhibition suppliers in the UK and worldwide and cater for all your exhibition needs. Our popular range of Chronoexpo banner stands are available to buy from our website. Superchrome’s banner stands are high quality, with high quality parts such as aluminium feet to keep them firmly grounded, yet light to carry. We supply a wide variety of stands including the lightest weight and easiest to carry, roll up stands and pop up stands. These are perfect to fit in your car and each one comes with a lightweight carry case to ensure that setting up your exhibition is a breeze. To create a larger stand all you need to do is lock multiple banner stands together. This allows you to create any size of display that you wish. We also have modular display stands. These are fully customisable to suit your needs. All you need to do is ask our friendly team of modular stand designers who will help you achieve your perfect solution. Superchrome are large format and wide format printers, as well as suppliers of banner stands. We have the top of the range HP Designjet wide format printers and the best quality HP inks. We use eco-friendly inks that will add superb colour to your banners and breathe life into them too. Superchrome banners will stand out and attract customers to your exhibition, trade show, sporting event and seminar. We print onto PVC banners, blue backed paper for posters and onto your roll up and pop up banners. We can print replacement graphics if yours have become old and tired. Our team of designers will also help you design your banners. All you need to do is order banner stands! Thank you for visiting Superchrome today. We look forward to helping you with your order. 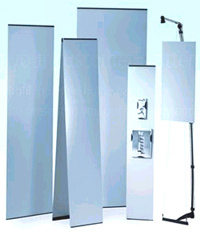 We are looking forward to creating your Banner stands.